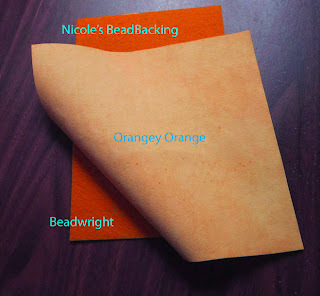 Beadwright Etsy Store. Orange, Yellow, Hawk, Zodiac blue, and a very beautiful Montauk. This color is an incredible grey/turquoise. All of our Ultrasuede comes with a FREE matching 9x6" sheet of Nicole's BeadBacking. How can you go wrong with that? Wishing all of you a happy day.